When Disney got control of Star Wars, it announced that pretty much everything that wasn’t a TV show or movie was no longer canon. That swept away a long tradition of considering almost everything produced in this universe as connected and part of the same universe. But as the new canon has developed, not everything taken away has stayed away. These are the planets, ships, characters, groups, and ideas that have all ended up back in canon. This post primarily covers material from after the announcement by Disney and Lucasfilm that the original Expanded Universe would be decanonized and transformed into Star Wars Legends—and following the rule that any Star Wars material from that point on would be officially considered part of the new canonical lore of the galaxy far, far away. However, the announcement threw a curveball by denoting that the animated Clone Wars series, which had been created with the direct input of George Lucas, would be joining the movies, the then-upcoming Star Wars Rebels, and future comics and novels as part of the canon. Clone Wars’ sixth and final season had already aired by the time of the EU’s decanonization, and was created at a time when the EU was still, for all intents and purposes, part of the wider Star Wars canon. Although events in Clone Wars could officially override anything from the EU—it changed several things, including the fate of Jedi Master Evan Piell, for example—the series liberally borrowed elements, concepts, characters, worlds, and designs from EU material to flesh out its world. That means that when it was officially canonized within Disney and Lucasfilm’s new canon, it retroactively made all of those EU-borrowed ideas (everything from Darth Bane, to the Black Sun crime empire, to Z-95 headhunters, and many, many more) canon material. For the sake of clarity and time, we’ve decided to only refer to EU material that has been since added to the new canon, post-Clone Wars and the original six movies. A perusal of the official Star Wars website’s databanks, however, can show just how many original EU ideas became canon through their use and re-imaginings on Clone Wars. Created for the tie-in novella that came in limited edition copies of the classic PC simulator game X-Wing, Agamar was the home planet of Keyan Farlander, the protagonist of the game, even though Farlander’s backstory is never covered within the game itself. Count Dooku mentioned the planet in the Clone Wars episode “Tipping Point,” establishing it in canon, but last year’s Rebels episode “The Last Battle” gave us our first official appearance of the planet, and borrowed elements of its appearance from the original EU version of the world. The site of a major battle between the Jedi Order of the Old Republic, thousands of years before the events of the movies, Malachor—or specifically, Malachor V—was a major world in the backstory of the Jedi Exile, the player-created protagonist of Obsidian Entertainment’s beloved RPG sequel. 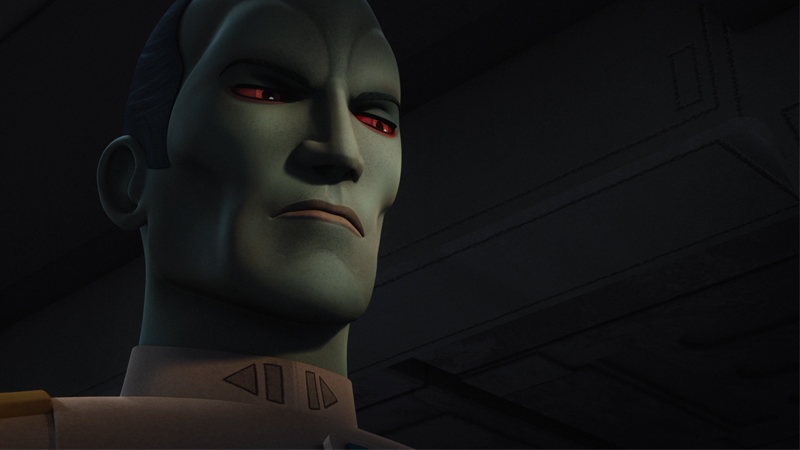 Malachor served as the stage for the final episodes of Rebels second season, and its appearance included some very heavy nods to the cataclysmic events that befell the planet in KotOR II, leading to fans of the Old Republic Era to hope that the period of EU history could one day make its way fully into Disney’s new canon. The first planet players find themselves on in Bioware’s RPG classic, Taris was an Ecumenopolis that was all but destroyed by a Sith planetary bombardment in the game’s opening act as players and their party fled the world. It would go on to become a major world in the Old Republic fiction, including an appearance as a playable location in the MMORPG followup, The Old Republic. But its mention as a location in one of the interludes of Chuck Wendig’s first novel in the Aftermath trilogy—the first official post-Return of the Jedi novel in the new canon—brought at least the world, if not the events of Knights of the Old Republic, with it. The infamous “smuggler’s moon,” and moon to Hutt homeworld Nal Hutta, Nar Shaddaa was a whole celestial body’s worth of trouble. The home of many a bad deal gone awry or a shady character, Nar Shaddaa was a fixture in stories about the surlier underbelly of the galaxy. That didn’t change when the second story arc of Marvel’s ongoing Star Wars comic gave the moon its first new canon appearance, as Luke Skywalker quickly discovered, in his quest to learn more about the Jedi, that the moon was just as seedy as it had been in the old EU. Originally part of an adventure for the West End Games Star Wars tabletop roleplaying game, Shantipole was actually a research station, the home of a crack team of rebel engineers who work creating the B-Wing in secret. When Rebels decided to bring in the B-Wing for its own storyline, the name was borrowed as a nod—but Shantipole itself was upgraded to a full-on planet, and kept its legacy in being part of the B-Wing’s development. Concord Dawn has a strange history in the EU—it was first mentioned as the homeworld of Boba Fett, whose real name was supposedly Jaster Mereel. Later EU works would split Mereel into his own character, and make Concord Dawn his homeworld. The planet would keep its Mandalorian roots when it transitioned into the new canon, however, as the home of Fenn Rau and his journeyman protectors in Rebels. While the above worlds have been given big roles in the new canon, it’s actually safe to assume that any world mentioned in the old EU is still part of the new canon, unless a new Star Wars story says so. Lucasfilm Story Group member and famous “keeper of the Holocrons” Leeland Chee took to Twitter last year to reassure fans that, unless stated otherwise, most planets created for the Expanded Universe would still exist in the new canon, with the same name and species—it’s just that details may change if they’re specifically mentioned, like all of the cases above. So there’s still hope for Zonama Sekot yet. Thrawn in Rebels, and Thrawn in TIE Fighter. A note: Save for one exception—because the change in his background is hilarious—we’ve only included characters who existed solely in the old EU and were brought forward. People who showed up onscreen in the movies and then were given bigger parts in the books aren’t here. Or you’d never stop reading this section. Moving Grand Admiral Thrawn from the old canon to the new is not only the biggest one of these, it’s probably the one fans were clamoring for the most. We’ve covered who Thrawn was before, but his appearance in Star Wars: Rebels kept the core of his character intact. He’s still a Chiss, still a ruthless commander, and still uses art as his primary source for understanding people. Rebels even gave him the ship Chimaera, which was his flagship in the old EU. The biggest change is that before, Thrawn’s assignments took him away from the Empire’s battles with the Rebels. That is definitely not the case in Rebels. Yes, Hobbie “appeared” in Empire Strikes Back, but his background was significantly expanded in the old EU. And somehow it’s even more complicated in the new canon. Hobbie’s got the interesting background of showing up for two defections. In Rebels, Hobbie defects from Skystrike Academy with Wedge. Except, Hobbie was also canonically on the Rand Ecliptic to defect with Biggs Darklighter. So now, the latter situation is the result of him having gone undercover and being at the Imperial Academy with Biggs and helping Biggs defect. This mirrors Hobbie’s name; he was give the name “Derek Klivian” in Star Wars: Card Trader and also the name Hobbie in Star Wars in 100 Scenes. He contains multitudes. Isard as he appeared in Dark Horse’s comics. Isard makes a brief appearance in James Luceno’s Tarkin, as a member of Emperor Palpatine’s inner circle. His name’s a much bigger deal to EU fans, since in the old books he’s the longtime Director of Imperial Intelligence, right up until his daughter framed him for treason and he was executed. His daughter, Ysane Isard, eventually took over his job and, for a brief time, the post-Palpatine Empire. Everything said about Pestage in the new canon, repeat for Dangor. He’s one of the emissaries on Geonosis and a member of the Imperial Ruling Council. In the old EU, Dangor was another close advisor to Palpatine, assuming most day-to-day running of the Empire during the conflict with the Rebel Alliance. After Palpatine died, Dangor managed to stay important and alive, which was itself a feat when the Empire kept losing leaders and direction. In the old EU, Screed was an Imperial admiral who served with Grand Moff Tarkin and who survived long enough to be one of the people trying to get control of what was left of the Empire after the death of Palpatine. He was killed by Warlord Zsinj. In the new canon, he’s still a one-eyed admiral. Now, he’s one of the few who saw the rebel threat a real problem. Battlefront: Twilight Company mentions Sian Tevv as a rebel with “known ties to Sullust.” Back in the old EU, Tevv was a Sullustan politician who was a leader in the fight against the Empire and in the New Republic. Arhul Narra was the starfighter commander in charge of Red Squadron after the Battle of Yavin, which had Wedge Antilles and Luke Skywalker as members. That’s roughly the same position he had in the old EU, although his backstory was a bit more developed. His most important job was to die so Luke could take command of Rogue Squadron, though. This is a weird one, in the sense that Malla was first introduced as Chewbacca’s wife in the infamous Star Wars Holiday Special and kept in the old EU. And she’s still his wife in the new EU. Nowadays, he’s just the captain of Tarkin’s flagship, the Executrix. Back in the EU, Darcc served on the Executrix, yes, but he went from there to governing Kashyyyk, and eventually made it to Moff. He fled when the planet’s liberation from the Empire was in process, and eventually died in a confrontation with the New Republic. Moff Therbon is mentioned in Tarkin by the ambassador to Murkhana, who requests more stormtroopers from him. And, basically, Therbon was just a named Grand Moff in the old EU as well. A special kind of Star Destroyer marked by a set of bulbous domes on its top and bottom, Interdictor cruisers were equipped with specialized “gravity well” generators that could stop any ship in the vicinity from entering hyperspace. The design of the ship, based on its description in Timothy Zahn’s iconic novel, was created for the Star Wars Roleplaying game as an “Immobilizer 418.” It would later be repurposed for the Interdictor’s first on-screen debut in Star Wars Rebels in 2015. A common sight in the Old Republic and the Imperial Navy, the Carrack-class was a light cruiser that was heavily armed and as fast as an X-wing. It was first mentioned in Heir to the Empire and was brought back into canon via a mention in Tarkin as part of a manifest of ships at a location. Although technically different ships, the Hammerhead corvettes created for Princess Leia’s debut in Rebels last year—and later used to stunning effect in Rogue One’s space battle—share both a name and some design aesthetics with the Hammerhead-class cruisers from Knights of the Old Republic, standard capital vessels in the Old Republic Navy. A classic ship made for one of the greatest Star Wars video games of all time, the Defender might have looked silly with its three-wing setup, but it was a ship to be feared in the Imperial Navy—as agile and lethal as the standard TIE Fighters, but equipped with shielding to rival that of the X-Wings. Although its soft-canon introduction came in EA’s free to play mobile game in 2014, the Defender will make its on screen debut in the second half of Star Wars Rebels third season this year. Best known to fans as the beloved ship of Dark Forces hero Kyle Katarn, the Moldy Crow, the HWK lived on as a beloved fighter class in the EU, eventually making its way to Fantasy Flight Game’s X-Wing miniatures series as a ship for the game’s “scum” faction. While it’s not the Crow itself, the model and design makes its debut in Marvel’s Kanan: The Last Padawan comic series. The type of starship used by Dash Rendar, the YT-2400 (known to fans more as the Outrider, Dash’s ship), was created as part of the EU’s first major multimedia campaign, Shadows of the Empire, a Lucas-approved connected story that played out across books, comics, games, and toys in the mid ‘90s. Although we first get to see a YT-2400 in great detail in last year’s “Iron Squadron” episode of Rebels, they were technically first canonized in the 1997 re-release of A New Hope—one freighter is seen in a blink-and-you’ll miss it cameo flying above the streets of Mos Eisley as Luke and Obi-Wan make their way into the town. While Clone Wars canonized the concept of force users—mainly Jedi—storing data and teachings in intricate devices called Holocrons, the idea of the Sith having their own counterpart (something that had been part of the EU for years) was only canonized last year by Rebels, when Ezra and Darth Maul found one as part of their exploration of the Sith temple on Malachor in the climax of season two. Despite only being recently added to the new canon, Sith holocrons kept the classic EU pyramid design (compared to the cube shapes of Jedi Holocrons) they’ve had since their first debut 22 years ago. One of the most controversial alterations Clone Wars made to EU material was the transformation of Mandalorians from an aggressive warrior culture largely explored in Karen Traviss’ beloved Republic Commando books, to a peace-loving democracy that had cast aside its old ways. Although that interpretation is now canon—a decision that ultimately pushed Traviss away from writing more Star Wars novels—some rare elements of Traviss’ Mando culture lived on in the new canon, such as this holographic game played by Sabine and Kanan. In both the old EU and the new canon, the government established by the Rebel Alliance once the Empire has been reduced to a minor power is called the New Republic. Of course, the new canon version has a very weak military, wasn’t based on Coruscant, and had a relatively weak Chancellor. The one in the EU was a bit stronger, although it was still just as prone to political gridlock, put its center back on Coruscant, and had a very robust military left over from the war. The ORSF was a paramilitary organization designed to protect planets in the Seswenna sector that couldn’t be effectively protected by official Republic Forces. But aside from being a major player in the events of the Stark Hyperspace War (a conflict between the Republic and a pirate organization called the Stark Collective just decades before The Phantom Menace) in the old canon, it had a major link to the history of Grand Moff Tarkin. The ORSF was founded by Ranulph Tarkin, a distant cousin of Whilhuff. The ORSF still exists in the new canon, as does cousin Ranulph, but he was retconned to have been a major commander in the organization rather than its founder. The Journeyman Protectors were the lawmen of Concord Dawn, led by Jaster Mareel and his band of warriors, a group Boba Fett himself would later join in the EU (once he and Jaster were retconned as separate characters). When Concord Dawn was revived as the homebase of Fenn Rau in Rebels, its protectors were brought with it as Rau’s group of Mandalorian mercenaries operating from the moon. The concept of the Empire having its own shadowy group of force sensitives to hunt down and eradicate what was left of the Jedi Order is one of the oldest in the EU, built out of the mention of an Imperial Inquisition in the original Star Wars Roleplaying game in 1988. Their history was almost exclusively brought out of EU material in the years since its creation, from their roles in the tabletop RPGs to appearances across books, comics, and games. But they were actually one of the first concepts from the EU brought over to new Disney-owned material, as the Grand Inquisitor and his order formed a major antagonist role in the very first season of Star Wars Rebels. The Imperial’s clandestine internal affairs branch was first really discussed in backstory created for the original West End Star Wars RPG to flesh out source material for Imperial characters to be used in the game, and continued to thrive throughout the EU as the Empire’s shady intelligence group. Although ISB agents such as Admiral Yularen appear as early in canon material as A New Hope, and operatives such as Agent Kallus appeared in Star Wars Rebels, the name “Imperial Security Bureau” was only officially canonized as the Imperial’s intelligence and internal affairs branch by its mention in Ezra’s Gamble, a tie-in novel released to coincide with the launch of the TV show in late 2014. The company that helped widely manufacture the B-Wing design has yet to be mentioned by name on-screen, although Rebels’ take on the origins of the B-Wing still indirectly notes that the fledgling Rebellion has found a shipworks to build the Starfighter for them. However, Slayn & Korpil were further reconnected back to the B-Wing’s origins with their mention in the Ultimate Star Wars Dictionary, making it official canon once again. A weapons manufacturer behind many iconic blasters in the Star Wars galaxy, the Czerka corporation itself is usually left unexplored by the EU in favour of covering the weaponry Czerka built in its stories. That said, Czerka played antagonistic roles in both Knights of the Old Republic games as a cruel, seedy business Empire, and while it has yet to physically show up in the new canon, Czerka is still namechecked as the manufacturer of military technology, ranging from Aurra Sing’s sniper rifle to the combat helmets worn in Rogue One. The Yellow Aces were an X-wing squadron that was home to Wes Janson and Jek “Piggy” Porkins. Porkins died during the assault on the first Death Star while Wes would eventually join Rogue Squadron. The helmet Rey finds on Jakku as well as the one worn by Jessika Pava in The Force Awakens both have the Yellow Aces’ emblem on them. This was one plot of the old EU that people didn’t really like, so we sure are glad that it made it to the new canon. In the old version, of course, the son was Jacen and he had a twin sister. Also, by the time he turned evil there were a lot of new Jedi out and about. In The Force Awakens, Kylo Ren’s betrayal leads to the death of all of Luke’s apprentices. Luke’s luck as a teacher is abysmal in every universe, by the way. This name hasn’t been used for the new canon version of Luke Skywalker’s Jedi, but Luke followed a similar path in the old EU. Like the New Republic, the rebuilt Jedi Order was named the New Jedi Order. It’s also the title of series of book in the old EU that had some not-so-beloved storylines. In the old EU, the Empire shrank in influence until it became the Imperial Remnant, with formal relations with the New Republic. In the new EU, the Empire proper surrendered to the New Republic, while most of its forces left before the treaty could strip the Empire of its military. The fleeing Imperial hardliners would help form the First Order. The original trilogy had two Death Stars. The EU had a plethora of devastating nightmares, including the Sun Crusher. And The Force Awakens brought us Starkiller Base. Rogue One was about, again, the Death Star. Even Catalyst: A Rogue One Novel had the idea of isolated scientist cells working on the Death Star, which was sort of included in the old EU. Of course, they hid the scientists working on it better there. In Rogue One, Scarif was a planet holding all the information about the Empire’s most secret projects. That’s why it’s got such intense security. That’s an idea the old EU had in spades. The complex full of information brings to mind Obroa-Skai, the library world. The planet full of secret projects is similar to the Maw Installation, an imperial research station in the EU that Grand Moff Tarkin built in an area of space with a cluster of black holes, making it really dangerous to get to. It was the scientists there that created the designs for the first Death Star. Saw Gerrera’s relationship to the Rebel Alliance in Rogue One was probably less confusing to EU fans, because it mimics that of Garm Bel Iblis. In the old EU, Bel Iblis had a number of confrontations with Mon Mothma—whom he suspected of gathering power so she could replace Palpatine—and eventually broke with the Alliance. Instead, he and his supporters started their own separate campaign against the Empire. While the reason for the break between Saw and the Rebellion was different, the result feels familiar.